The courtyard of a compound in Mbour, Senegal, is a hive of activity. At first glance, it looks like a party — brightly dressed mothers and children dancing to energetic drumming, a few women nearby stirring an enormous communal bowl, a few more chatting around a table as they set up jars, papers and equipment. But not all of the children are dancing. Some toddlers sit quietly, leaning back in their mothers’ laps, watching the activity with their mouths hanging slightly open. They look like small old people, with shadows under their eyes and their clothes loose around their fragile shoulders. 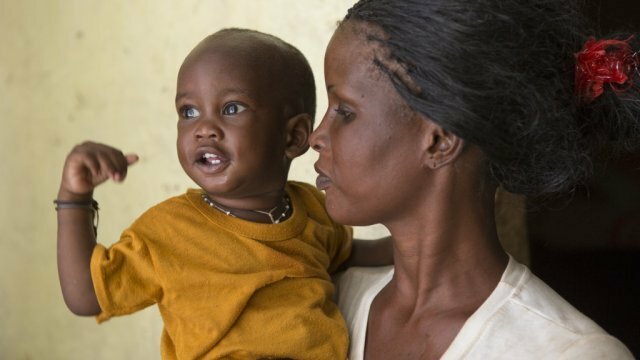 The workshop is part of a USAID-supported community health program led by ChildFund, to establish community health care services for Senegal’s children and families in need. Trained health volunteers, locally known as relais, provide basic care and referral services through more than 2,000 health huts and 1,700 outreach sites nationwide. They also work to educate their communities about preventive health, whether at the health huts or through home visits and events like this one. The nutrition and recovery workshops include growth monitoring, nutrition education and individual counselling, delivered with song and dance and a meal. A hanging scale is set up near the table covered with papers, medicines, jars of preserves and packs of beans and flour. A pair of relais weighs each child. Then, mothers and children have a seat at the table, where another relais measures their arm circumference, assesses them for other symptoms and provides counselling as needed. A young mother, frail herself, listens as a relais explains the worrisome measurements just taken on her 1-year-old, who droops in her lap, staring into space. Soon it’s time for the meal, and mothers and children dig in. Within minutes, there are a dozen messy faces. “Today, we prepared a rich porridge — rice, peanuts, smoked fish, beans and oil,” Saly explains later. “We teach the mothers the importance of each ingredient, the helpful vitamins in each. This meal helps the child to have much more energy, and to grow.” The mothers love their children, she adds, but they don’t have good feeding practices; traditionally, the smallest children are allowed only the rice from the family bowl. One mother stands at the edge of the group, blowing raspberries into her little boy’s neck. His eyes light up, and his laughter sounds like bells. Kumba Diop, another relais, tells his story. “Ndiaga suddenly lost a lot of weight, got very sick and was hospitalized,” she says, and explains that the 11-month-old had picked up an intestinal parasite that disrupted nutrient absorption to the point that he became severely malnourished. “He was in such a desperate situation that it’s hard to believe Ndiaga is still with us today.” That was just 10 days ago.